Background: The molecular mechanism of the type 2 diabetes mellitus (T2DM) remains unclear. Objective: This research aimed to investigate key genes in T2DM via combining mAP-KL and mutual information network (MIN) and give great insights to reveal pathological mechanism underlying this disease. Methods: First of all, the data of gene expression profile of T2DM were recruited and preprocessed; then mAP-KL was implemented to investigate clusters and exemplars in T2DM; in the following, support vector machines (SVM) model was selected to evaluate the classification performance of mAPKL; finally, MIN construction and topological analysis were performed to investigate key genes. Results: A total of 20,541 gene symbols were obtained from expression profile of T2DM. By applying mAP-KL, 12 clusters were identified. From Cluster 1 to Cluster 12, their exemplars were OGT, TTC22, LIMCH1, NENF, ROMO1, RGL2, TCF7L1, KRTAP4-4, POLR2F, KIF22, NDUFB11, and AGL, respectively. The results of evaluation by SVM model indicated that the mAP-KL methodology was feasible and suitable for identifying exemplars of T2DM. Finally, MIN construction and topological analysis indicated that there were four hub genes (degree centrality ≥ 100): TCF7L1 (degree = 104), LIMCH1 (degree = 102), NENF (degree = 101), TTC22 (degree = 101), which might be potentially novel predictive and prognostic markers for T2DM. Conclusion: We predict these hub genes (such as TCF7L1 and LIMCH1) might play key roles during the occurrence and development of T2DM and are potentially novel predictive and prognostic markers for T2DM. 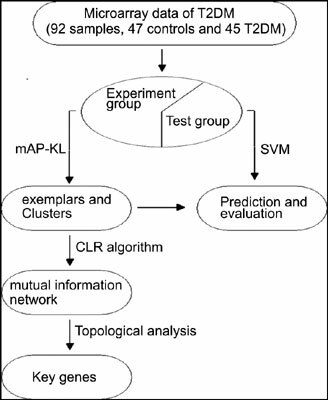 Type 2 diabetes mellitus, mAP-KL, cluster, mutual information network, support vector machines, hub genes.